1-15: After listening to a short text, you have to choose the one of the four listed answers which you think is most appropriate. 16-30: In this section, the recording of three interviews will be played, followed by 5 questions with 4 answers each. As before, you need to pick the answer you think fits best. 31-50: This final listening part is similar to part 1 with the difference that the text might be longer and there will mostly be more then one question per text. 51-60: In the first reading part you get 4 sentences per question and you need to pick the one which is grammatically incorrect. 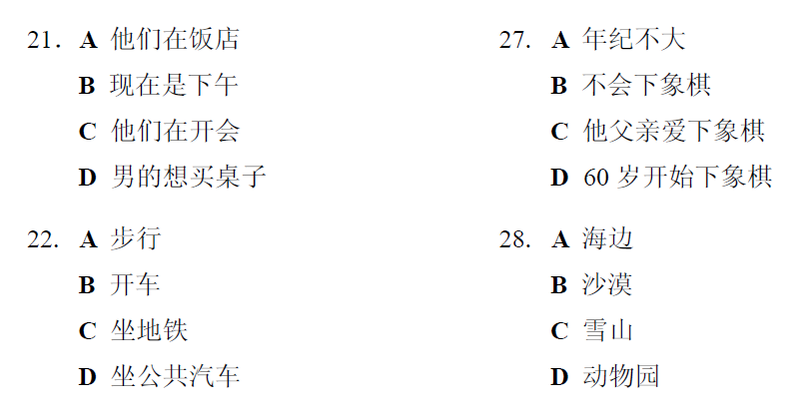 61-70: The next ten questions consist of a short text with 3-5 gaps each. Furthermore you get 4 different answers with the sequence of words to fill the gaps with, you need to pick the right one. 71-80: Part three consists of two long articles with 5 gaps each. 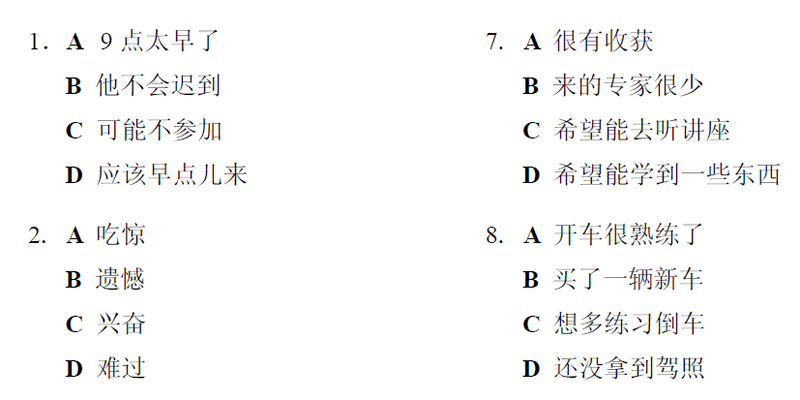 Your task is to fill in the right letter according to the sentences given below. 81-100: Finally you get 5 relatively long articles with 4 questions each. Each question itself has 4 answers, you need to pick the one fitting best. 101: The writing part is one big point where you get an article of around 1000 characters to read. You have 10 minutes to study this article properly, after that it will be taken away from you and you have 35 minutes to rewrite the article from what you remember. Your article should have around 400 characters and you should furthermore find a suitable title. 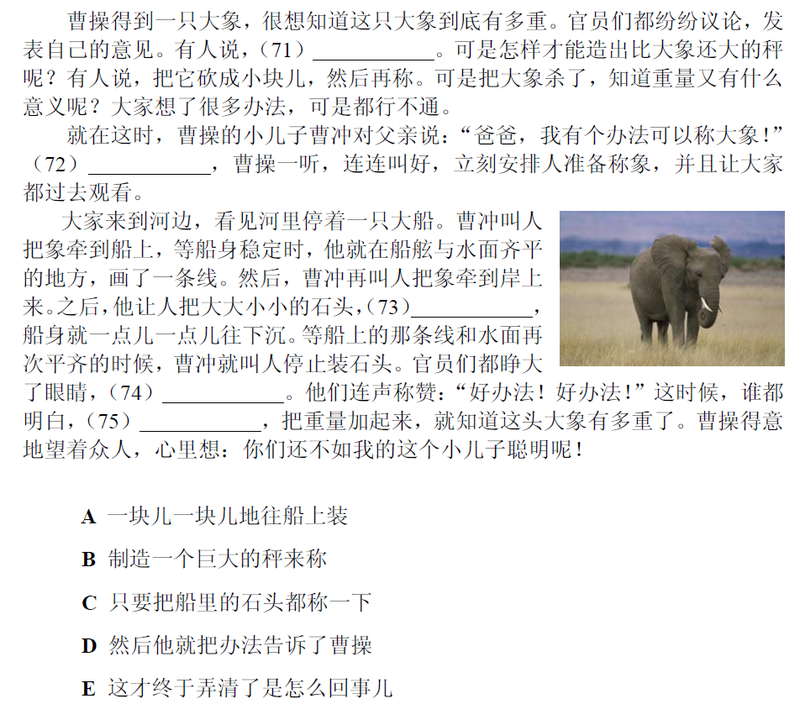 The sample pictures above as well as the information where taken or derived from chinaeducenter.com. On this website you can find further information, the outline of the 5000 vocabularies as well as a mock test with mp3 needed for the listening (as part of the outline vocabulary download package). Have a look at this, it might be very helpful in the course of preparing for the test.